Learn about the 3 Best SQL Database Repair Tool for Database Administrators. These top SQL database restore software are in high demand by employers. Relational Database, be it MS SQL Server, Oracle, MySQL Database, or Sybase; all are in high demand. Structured Query Language (SQL) is a primary language intended to deal with these databases. Using this programming language, operations like insert, delete, search, optimize, update, and maintenance are quite easy to execute. With that said, it will not be erroneous to state SQL as the ideal programming language to handle relational databases. But, in contrast, despite success, the occurrence of issues like MDF file corruption issue or connection and operation timeouts is also quite common. And, if not identified or dealt timely can result in further aggravation and lead to database inaccessible. Thus, to counterbalance this limitation, there is a dire need for best SQL Database Repair Tool. 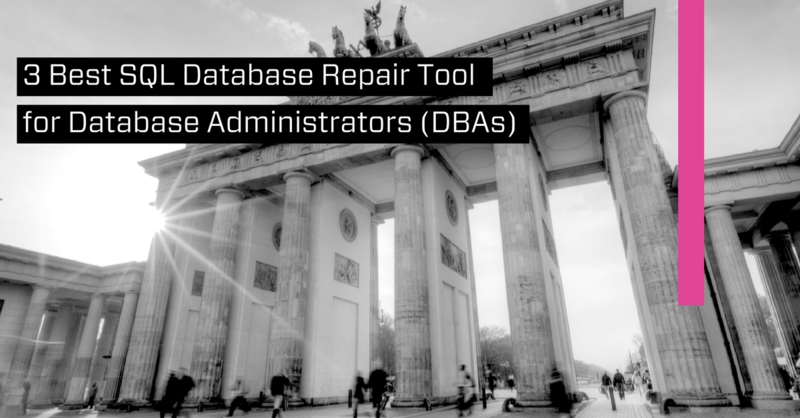 The following post sheds light on such 3 best SQL Database Repair Tool for Database Administrators (DBAs). Read ahead to find the viable option depending on the needs. Out of the top 3 SQL Database Repair Software, Stellar Phoenix SQL Database Repair is one of the best tools. MVPs Choice award self-justifies the effectiveness and remarkable functionality of this secure and reliable software. With hands on this software, both jobs—Corrupt SQL database files repair and inaccessible objects recovery are quite straightforward. This software is potent enough to handle .mdf as well as an .ndf file of any level and corruption type. How Is the Software Distinct? Another smart software in the list of top 3 SQL Database Repair Software is SysTools SQL Recovery. Using this software, both primary and secondary database files (MDF and NDF) are quite easy to repair. This software ensures unlimited SQL database files fix under all types of corruption scenarios. Whether there is a need to recover Unique Keys, Functions, Stored Procedure, Associated Primary Key, Tables, Data Types, Triggers, Rules, or Views, count on this software. DiskInternal MS SQL Recovery software provides dedicated SQL recovery in a single package; i.e., damaged database repair and reconstruction. Features like advanced recovery algorithms make MS SQL databases recovery an easy task. Whether it is a case of damaged, formatted, or inaccessible disk, the software works seamlessly. Repairs different components such as Views, System information, Unique keys, Triggers, Indexes, etc. Feel like another great SQL Database Repair missed out. Share in the comments section to enhance the information! Access file recovery tool is an eminent solution to rebuild and recover and repair damaged MDB or ACCDB database file. It is one of the best option to recover corrupted database.-It supports MS Access 2013/2010/2007/2003/XP/2000/97/95. Here I would like to refer another excellent third party software, Kernel for SQL Recovery. It is an excellent third party software, compatible with MDF/NDF files of a MS SQL server. Its free demo version is also available to evaluate its features and functionalities. Thanks for sharing MS SQL Database recovery tools. My experience is with SysTools SQL Recovery, which guarantee about quick SQL MDF recovery with its handy features and economical, in just $129. whether others like Stellar Phoenix SQL Database Repair has $349 and Diskinternals MSSQL Recovery has $399. The SysTools SQL Recovery is not only for database recovery from MDF/NDF files, it allows you to convert MDF to .SQL scripts, Migrate Tables and other database objects from one database to another and migrate between Server to Server. Such a great tool in affordable price of $129 with handy features and has lifetime license.